1.8 L Eco WT DOHC. 4 cylinder, 6 speed transmission. A modest 138 horsepower is sufficient - once the car gets going it has good speed. The car handles well and feels comfortable for all passengers. Four cylinder, 1.8 liter four. It's surprisingly peppy, but the overall performance and noise could be smoothed out a bit on the engine. This attractive vehicle is setting up Chevrolet to win. This is the first year for the Cruze in the United States, a truly competitive compact going up against the Toyota Corolla and Honda Civic; so much so, Chevrolet dealers want you to test drive all three for comparative purposes. A slightly bigger-than-compact, this car has value galore. The interior is very well laid out, has great roominess and legroom. The rear seat has aa 60/40 split. Rear armrest has center armrest. Trunk has cavernous space toting 15 cubic feet. Probably the most important car in GM's lineup because it will sell in large numbers with its extremely high quality, huge value proposition, room, and much better performer overall than Toyota Corolla or Honda Civic. It was introduced in Europe before arriving on these shores. Replaces the Cobalt. 10 airbags; also driver and front passenger frontal, knee, side impact and head curtain with rear passenger side impact and head curtains. Stability control with traction control. Anti lock brakes, LATCH anchors, keyless entry, tire pressure monitor and OnStar navigation and crash response provided -with a six month subscription. Antilock brakes, stability and traction control, plenty of airbags everywhere, OnStar with turn by turn an crash response, etc. XM Sirius is free for 3 months. USB Audio interface, Bluetooth™, and steering wheel controls. Lots of sound deadening equipment used, making this one of the quietest compacts around, driver information center with personalization, warnings, messages and vehicle information, folding rear 60/40 folding rear split seat, lockout protection on power door locks, satellite radio, etc. The exterior has universal appeal and design. Nothing exceptional, but appealing to the middle. Held up with 16" alloy wheels. Slight tint to windows. The interior is clean and uncluttered. The cabin is roomy, legroom is spacious. Controls are clean and easy to view and use. Attractive enough, but way too conservative considering the daring Ford Focus and futuristic looking Hyundai Elantra, two of its biggest competitors. And I expect big things from the new Honda Civic coming out in the next model year or two, as well as Toyota's venerable Corolla when it's up for renewal. The Cruze looks much better in lighter colors; stay away from the darker colors which make the car look even more dated. This is a very strong competitive entry level car. It is being made and assembled in the Lordstown, Ohio plant. This vehicle is a winner - good for GM and good for the car's owner's! 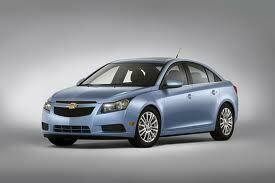 The Cruze is so much better equipped and finished than the Cobalt, as well as its current competitors. The inside is beautiful with a two tone treatment and tasteful metals used as trim. It's a strong value, and should sell really well for Chevy.